Juliette Verrengia is a senior at Connecticut College studying Human Development and Sociology. 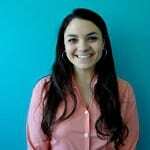 She is in her second year of an internship with the Director of Sexual Violence Prevention and Advocacy at Connecticut College. As an intern, she contributes to the implementation of the Green Dot program at Connecticut College, helps to oversee a group of anti-violence peer educators with her co-interns, and works on programming with Darcie Folsom, the director of the Think S.A.F.E. (Sexual Assault Free Environment) Project. After graduation, she hopes to pursue social work and get her Masters in New York City, NY.